Ever wonder how the McMahon family became sports entertainment tycoons? 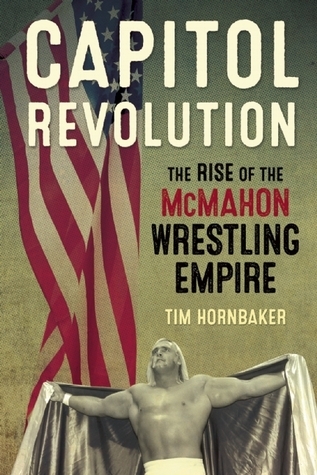 It’s all here in Tim Hornbaker’s Capitol Revolution: The Rise of the McMahon Wrestling Empire. I received a free copy from ECW Press in exchange for an honest review. Hornbaker goes back, waaaay back, to the beginning of the 20th century to discuss the roots of pro wrestling in the Northeastern United States. From there, he travels through time, spotlighting battles with the government and rival promoters, internal politics among the performers, all the way to the bustling 1980s where Vince McMahon Jr. would establish a death grip on the business, a death grip that still holds today. At this point, I think half of all the knowledge I’ve learned in my life is made up of obscure pro wrestling history and trivia. That being said, Hornbaker’s look at the dominance of the McMahon family’s WWWF (World Wide Wrestling Federation) did manage to fill in a lot of gaps. However, I found the writing to be a little dry and some of the subject matter to be a little dull. This is no slight against Hornback as I’m going into this knowing a lot about the business and I tend to sway more toward the modern era of the 70s through to today rather than the early days. Seeing as we’re probably never going to get a proper Vince McMahon Jr. biography – as long as he’s alive anyway – Capitol Revolution should satisfy those looking for an in depth telling of the McMahon family history and the events that led to their meteoric rise. January 24, 2015 in Non-Fiction, Pro Wrestling, Tim Hornbaker.